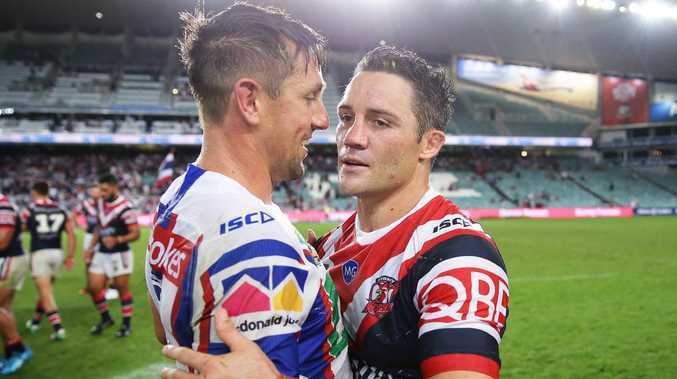 Cooper Cronk forced Mitchell Pearce out of the Roosters. IF the Roosters don't win the premiership then the Cooper Cronk signing will go down as a mistake. That is the opinion of former Tigers legend Steve 'Blocker' Roach, who believes the Roosters need to win the premiership to justify getting rid of Mitchell Pearce. Cronk was brought to the club to take the Roosters to the next level after three preliminary final exits, and nothing short of a grand final win will validate the move, according to Roach. "If they don't win the competition, it's a failure," he said. "The whole reasoning to get Cooper Cronk was to win the premiership. "Mitchell Pearce had already won them a premiership and got them there, so I was out of my head about it when they signed Cronk. "Pearce was going to be a one-club player and then got moved on." Cronk's skills and quality were on show against the Sharks in the first week of finals, when he iced the game with a late field goal. Cooper Cronk slots the match-sealing field goal against the Sharks. In the pressure cooker of finals football, it was a criticism of Pearce that he failed to come up with the right plays in the clutch moments. However, Roach sees frailties in Cronk's game, too. "I think he eats the pressure, Cooper Cronk," Roach admitted. "But I don't think he is any better than what Mitchell Pearce is, if you look at both those guys and what they bring to the football team. "I would say that Pearce runs the football a lot more than Cronk and is probably a bit more threatening. "Cooper is that used to winning and getting his team home." Cronk has made his career off a water-tight kicking game and excellent defence and his kick chase is one of the best in the competition. One of the criticisms of Cronk earlier in the season when the Roosters were struggling was that he didn't challenge the line enough with his running game. "We have seen how balanced he is and how calm and collected he is, but he's not a real threatening player," Roach said. "If you're looking for players that you've got to watch and that are going to cause you destruction, I don't think Cooper is that type of player. "I think he is a player that sits back and watches the game and if he is in the position to get you home, he will nail it 19 out of 20 times, but his football side has got to get him in that position. "I don't think he is a threatening player as in a match-winner, but if the team gets into a position to win, he can get you home." Roach believes the onus is on Cronk's teammates to get the Roosters in a position where Cronk's strengths can be used. However, if the Rabbitohs get off to a fast start, they may have too many weapons for the Roosters to keep the game tight and bring Cronk into his element. "I think if they start well, the Rabbitohs have too many points in them for the Roosters," Roach said. "They create more opportunities and the Roosters like getting down in that grind and are a wonderful defensive side. "But without Latrell Mitchell, who creates three or four chances every game they might struggle to score points. "Aubusson coming into the side is a great, safe player and will play for 80 minutes and won't make a mistake. "But in the big games, you need someone who can break open the defensive line and I think Souths have the players to do that."